The Asian salad dressing is surprisingly easy to make and will keep longer in the refrigerator since it is oil and vinegar based. I suggest whipping up a batch to keep in the frig as it is much better after a day or two giving flavors time to blend and infuse with the oil. I store in jars that have a tight fitted lid. Try any of these dressings on cabbage salads or chicken salad. My favorite is the Asian Vinaigrette on romaine lettuce with chunks of chicken. So simple and easy to make for quick lunch. Put all ingredients into a shaker to blend. Put in refrigerator until ready to serve over a salad. It is Best if made at least one hour before serving. In a shaker or jar with tight fitting cover, combine the garlic, ginger, olive oil, rice vinegar, soy sauce, honey, and water and shake well. Remove lid, and heat jar in the microwave for 1 minute just to dissolve the honey. Let cool and store covered in the refrigerator. Shake well before serving. Put ginger, rice wine vinegar, brown sugar and soy sauce in a medium mixing bowl and whisk together. Whisk in chili sauce, avoid any lumps. Add the grape seed oil, whisking again to incorporate oil into vinegar mixture. 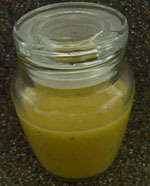 You will need to shake or mix the dressing again immediately before serving. Pour over bed of lettuce with diced chicken breast, grated and diced vegetables.